The Klezmer revival began in earnest in the '80s, when the repertoires of clarinetists Naftule Brandwein and Dave Tarras were rediscovered by a new generation of jazz, avant-garde and folk musicians. Instrumentalists, primarily violinists and clarinetists, tried to sound like these two giants while also integrating other more rhythmically complex musics. At one point the last thing anyone needed was another version of Brandwein's "Firn Di Mekhutonim Aheym." Finger-picking acoustic guitarist Tim Sparks comes at all this, however, from a completely different direction. An amazing technician with elements of guitarists Leo Kottke, John Fahey, Lenny Breau, Andrés Segovia and Doc Watson, Sparks stands alone in his ability to arrange and abstract worldly elements into a cohesive guitar-based approach. 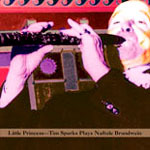 Little Princess features an all-Brandwein program combining technique, superb arrangements and jazz improvisation for a very revealing look at ten Brandwein tunes. This is the fourth release for Sparks on the Tzadik label that highlights his take on Jewish material although "Firn" is not here, check his previous At the Rebbe's Table (2002) for itand these arrangements stand out as his best so far. With current klezmer bands now typically looking to pre-Brandwein Eastern Europe for source material, Sparks has accomplished what most of them didn't, which is to expose the stylistic layers that exist in Brandwein's exquisite compositions. Perhaps because Brandwein's own musical pastiche, which included Jewish, Rom and Turkish, is as varied as Sparks'; the two are kindred spirits who come together beautifully and elegantly. What Brandwein didn't have, of course, was a rhythm section the equal of bassist Greg Cohen and percussionist Cyro Baptista. They up the ante for these tunes by adding their own bossa/samba layers to the complexities already present. Little Princess is not only a unique look at Brandwein's legacy but a major addition to the world music canon. Track Listing: The Rebbe's Hasid (Dem Rebin's Chusid); Der Yid In Jerusalem;Oh Daddy, That's Good (Oy Tate, Si'is Gut); Little Princess (Kleine Princessin); Nifty's Freylekh; A Few Bowls Turkish (Turkishe Yalle Vey Uve); The Dearest In Bukovina (Das Teureste in Bukowina); Leben Zol Palestina; Turkish Circle Dance (Der Terkisher-Bulgar Tanz); A Bagel With Onions (A Hora Mit Tzibeles). Personnel: Tim Sparks: steel-string acoustic guitar; Greg Cohen: bass; Cyro Baptista: percussion.